OK, I want one. For Kaylee. and I'm going to order one today. So what am I talking about. SANTA LETTERS. This one however comes from the very adept hand of Sarah Hanna of Winter Park (see Christmasyy -ish) Florida. 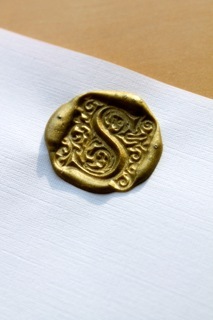 So what is so special about Sarah's letters. Well for one, while they may not carry the "north pole" postmark they carry something much more to me than that. They carry CRAFTSMANSHIP. 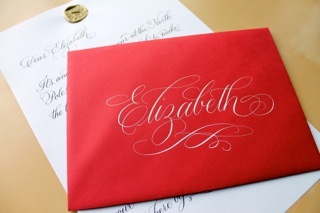 All of her letters are a one off, all personalized and HAND DONE. 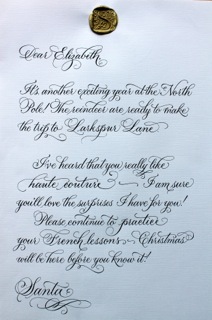 Not sure about you folks, but last year we ordered one for Kaylee and I was really disappointed in the "churned out" pre-typed, on standard letterhead I could have picked up at the local Michael's. Sure I could have "added" some reindeer poo, or a hoof stamp (I have one of those). Pretty sure I could even come up with my own North Pole meter stamp if I looked. What I would rather have sitting in the tree is this lovely letter in the RED envelope she couldn't possibly miss on Christmas morning. So.. What do you get? Glad you asked. Contact Sarah. Click -> Here <- She will send you out 2 PDF files with the order form and some "suggestions" for the CRS/SMH (stole that last one from Limner) old folks who may need some creative inspiration. She Charges $20 + $5 for shipping. I would have paid more than that for the Crap Fest I received last year.. Ooo But it came with a on the "Nice List" certificate. She will also send you some photos of the possibles. And package it for you to stash until your spawn is passed out from the sugar high she has been on all Christmas Eve pounding hot chocolate and whip cream like some junkie that's going to be cut off before going to jail only to wake up in the morning feeling like crap and finding out the Governor has granted a pardon and find this hanging in the tree. 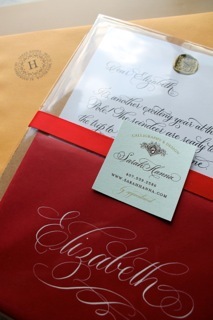 So for the parents that want a touch of elegance and something you will WANT to keep in the family Christmas scrapbook. Check out Sarah's site. You won't be disappointed. Sarah mailed mine this morning. When I get the one for Kaylee, I'll post it here. Can't wait. 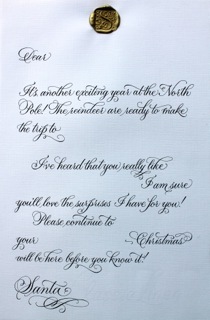 I ordered a "pre-letter" and the christmas morning letter.